This little hummingbird visits my feeder in the summer. I named him Henri after Henri Matisse. I’ve been wanting to paint him ever since I snapped this photo last summer. 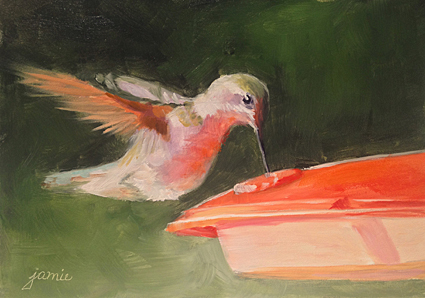 I loved the reflected red light from the feeder on his chest. It’s been so cold here in the northeastern U.S. that I figured it was time for some warm summer memories, and did this painting of Henri. $150.00 plus $10 shipping and insurance within the Continental United States. For local sales, shipping charge will be allocated to NYS Sales Tax. Please email me at JamieWG@aol.com for International purchases or with any questions. 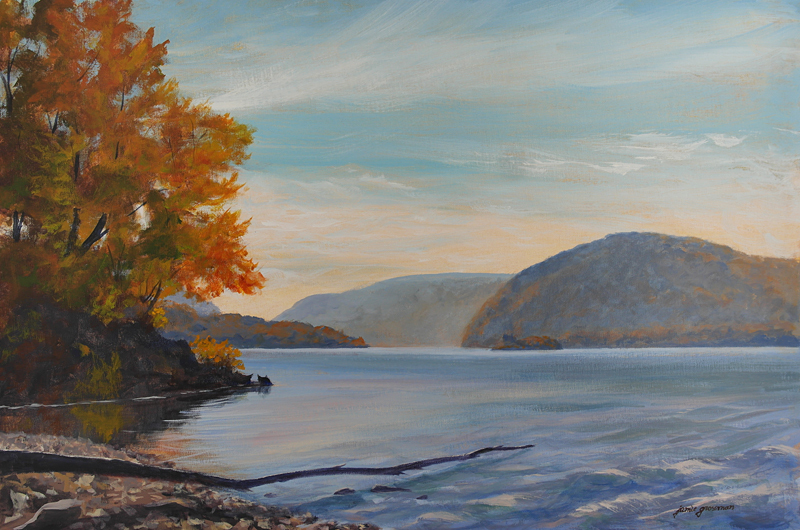 Painted from a photo overlooking the Hudson River at the Vanderbilt Mansion in Hyde Park, NY. My husband and I went for a hike and photo expedition in late fall along the Hudson River. 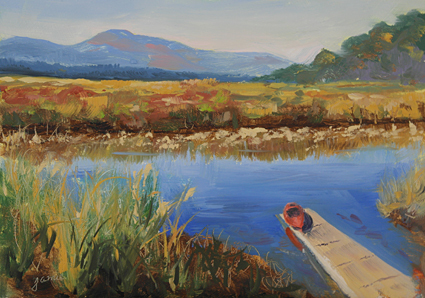 I loved this scene with the kayak ramp, marsh, and Catskill Mountains in the background. When a kayaker came in to land and pulled her bright red kayak up onto the dock, I made sure to get the photo before she had a chance to take it away! I loved that pop of strong color in the scene. This is a scene from way up on a hillside at Frederic Church’s Olana estate. I don’t come up here often; it’s a long way to hike with paints, but I always bring my camera! There were wonderful cloud patterns in the sky on this particular fall evening. I was happy to capture a few images from which to paint. $225.00 plus $15 shipping and insurance within the Continental United States. For local sales, shipping charge will be allocated to NYS Sales Tax. Please email me at JamieWG@aol.com for International purchases or with any questions. 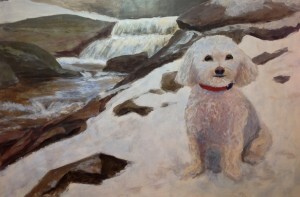 This was painted on a cold, drizzly fall day with a group of hardy artist friends! Love in the Big Apple — Perfect Valentine Gift! I had a great time preparing surfaces with cut up old maps. I glued the map pieces to archival, acid free foam board with Lineco acid-free bookbinding adhesive, rolled it with a brayer, and weighted it down to set. Then I applied a couple of coats of Golden Matte Medium, mainly because I love the working properties of the surface once the matte medium is applied, and it will also help to seal and protect the maps. 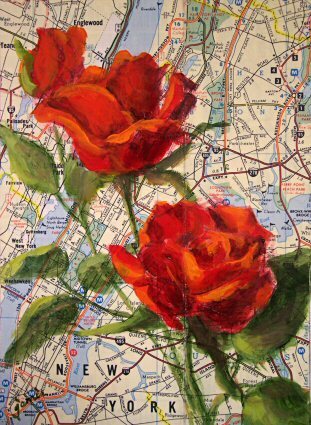 I painted this New York City map with roses for Valentine’s Day. What could be better than Love in the Big Apple? If you’d like to commission a similar painting of any size with your own city and choice of flowers, please contact me at JamieWG@aol.com for details. This painting can be popped right into a standard 5×7″ frame. 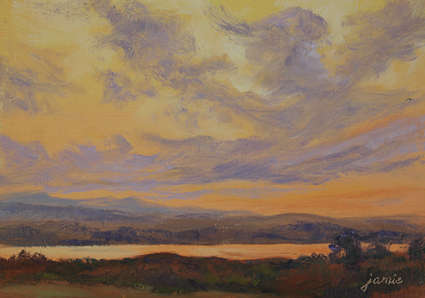 This was painted from a scenic drive on Bear Mountain. 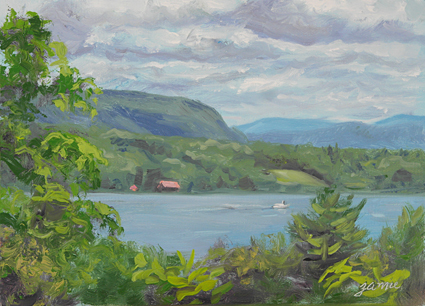 Facing upriver there’s a great view of Iona Island (which I’ve also painted many times), and downriver is this fabulous vista through the Hudson Highlands. The Appalachian Trail crosses the Hudson on this bridge. There were large boats and barges going by, and sailboats off in the distance, which I put into the painting as I saw them. With the autumn colors, it was truly a spectacular day. It’s taken me awhile to get around to taking the photo of the painting and posting it. 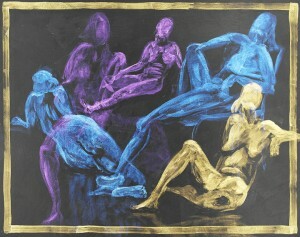 But the good news is that by now the painting is dry and can be sent out to a new home! Display easel included. Painting is sent framed, in gold gift box with bow and easel. 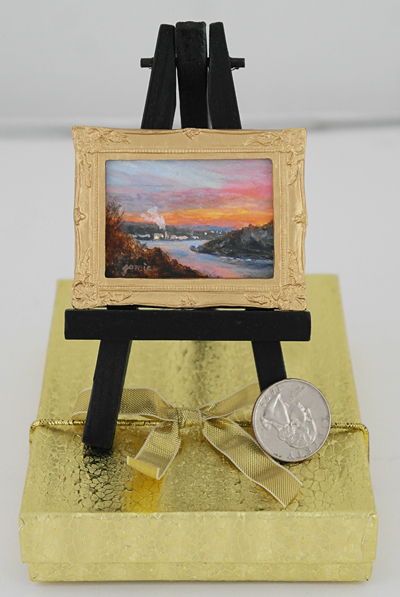 This miniature sunset featuring the Hudson River is the perfect gift for that special someone. Everybody has a place for one of these little gems, and they arrive already framed, in a gold gift box with the display easel. To see more of my miniature paintings, click here and scroll down. This was painted from a Hudson River overlook near the Bear Mountain Bridge. My husband and I went on a photo expedition and were treated to a great sunset, which made it worth putting up with freezing cold temperatures! I got a bunch of great photos to work from during the winter, so stay tuned!